These devices are found in your Switch board understanding these devices and how to use and maintain them will help your management and understanding of Electrical Safety in the Workplace. Fuses and circuit breakers are built to fail in conditions of excess current which can overload the electrical wires in your home. These overloads are often caused by faulty appliances. When an overload occurs, the fuse melts before the wires can overheat, which reduces the risk of fire. Circuit breakers will often trip quicker and more importantly they can be reset to help diagnose and remove faults. Always replace a blown fuse with the correct fuse wire. Never use fuse wire that is heavier than the recommended gauge. Never use any other type metal or wire. 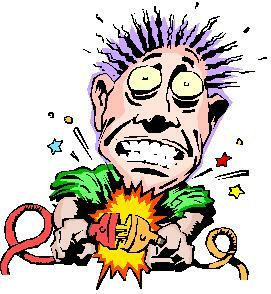 If fuses keeps blowing, or a circuit breaker trips, check your appliances are not faulty. If fuses continue to blow, or circuit breakers continue to trip after appliances are unplugged, there could be a problem with your wiring. Contact a licensed electrician immediately. Safety switches look similar to circuit breakers, but they provide extra protection from electric shock. Safety switches monitor the flow of electricity and if any irregularity is detected, the electricity supply is immediately cut off. Of course the best way is to ensure that your appliances are not hazardous in the first place. Tested & True ~ test & tag comes to your work place at a time convenient to you. We can do an assessment of your Electrical Hazards it can be conducted at the same time as we test and tag your Electrical Equipment. We provide a Full Report with recommendations to clear up current Hazards and how to prevent future risks. Call and ask for a quote. 0407 605 568.. Tested & True ~ test & tag uses the very latest in Portable Appliance Testing…The STC Pro-Logger 2 it can perform static testing class 1,2 & M RCD testing, Earth Leakage Detection, 3 phase run testing and logs results as you test. all in one neat piece of equipment. On top this all our Technicians are Trained to National Standard UEENEEP008 in test & tag operations by Intertag in Sydney NSW, all our Equipment is in good repair and in Calibration. Most of all we pride ourselves on our Knowledge of OH&S legislation and the current Australian Standards ensuring that you get Quality Service at a competitive price. Summers here! … and Summer In Australia means Power Shortages and often leading to Blackouts (no power) or brownouts (low power ie low voltage and current) sometimes these are planned by the Electricity Suppliers to share the extra load during Hot Days… sometimes they occur unplanned because of overloaded or failed equipment either way Your expensive computer or in the case of a business your Server and the data in it could be rendered useless. UPS is the easiest way to protect your hardware and data. For a better and more thorough protection, you need a UPS. It isn’t intended to power you through a blackout though. For that, you would need a generator. Rather, a UPS will let you save your work and power down safely. A UPS is designed to protect your computer you against such power fluctuations and more importantly, power up your computer even when there is no electricity. Here are a few tips that should help you make a more informed UPS purchasing decision. When purchasing a UPS, make sure the power rating is right for your equipment. If you buy one that is rated too low, you might run out of juice before you can power down. Most UPS devices are designed to provide 10 minutes of power. When selecting a UPS, you need to look at the VA rating — or amps multiplied by voltage (240v). The amp rating should be listed on your computer. Add up the VA ratings of everything you will connect to the UPS, then purchase a UPS with a VA rating 20-25% higher. If you are a home PC user, look for a UPS with a 1000-1400 VA rating. Don’t expect your UPS to keep your PC running all day. Most UPSes are engineered to provide you a backup time of around 10 to 20 minutes. What they essentially do is save your work when there is a power outage and avoid an abrupt shutdown that could mess up your computer settings. Choose the UPS that meets your backup time demands. When you are buying a UPS, ask the vendor about more features than just power. This will help you in finding the UPS which has that one additional option that will help you in your buying decision. Of course, the best feature is Automatic Voltage Regulation (AVR) which isolates your PC from voltage fluctuations that lead to computer disturbances. A UPS with AVR conditions the incoming power before being fed to the PC’s Switch Mode Power Supply (SMPS). Most UPSes also automatically initiate a scheduled shutdown sequence when the power is lost, after saving your work, to prevent damage to the computer hardware. Obtain a guarantee before buying a UPS. Undue delays in replacements can affect business. Some vendors offer onsite warranties, where they replace the batteries at your place. If you are planning to use the UPS at work, go for a longer warranty term. The general rule is three years. But if you are experiencing low backup times more frequently, you could get the battery replaced immediately if it’s under warranty. If you are facing no problems, expect your battery to work for three years. Its advisable to buy replacement battery cartridges while you are buying the UPS. These cartridges will breathe new life into UPS systems suffering from expired or weak internal batteries. Contrary to the myth, its perfectly fine to leave the main switch on even when you are no longer working and the computer is shut down. However, its best to pair your UPS with a voltage stabilizer for additional safety. The software provided with the UPS is not always accurate with its reports. So don’t listen to it when it says your battery needs to be replaced even though you’ve never experienced low backup times. These faulty reports shouldn’t worry you because they may be trying to get you to purchase the company’s product more frequently (a common problem with print cartridges.) The software is good at its essential function of shutting down the PC properly and saving your work, but you may be the best option to determine whether its time to change the battery. Do not overload the UPS by, for example, connecting external devices like the printer, scanner and the fax machine. NEVER plug a printer into the battery backup system. To optimize the charge of your batteries, you should discharge them completely at least once a month. And lastly, make sure the UPS is properly grounded all the time to prevent any electrical disasters. Shop around compare specifications against Price.. Standby UPSs are available in the range of 300VA to 500VA for office use, and up to 2KVA to 3KVA for workstations and large servers. Inexpensive standby UPSs ranging in price from $50 to $125 are used by millions of users of personal computers all over the world. Some of them include brands like Belkin, American Power Conversion (APC), Cyber Power, Data Shield, EFI, NCR, SAFE, Pacific Power, Sola and UP Sonic. Basically , there are two kinds of UPS systems. The Standby Power System (SPS) and Online UPS System. If you are a home user, go for the relatively cheaper SPS. The price of an online UPS is three to five times that of a standby UPS with the same power rating. For servers, buy an online UPS (online means outgoing power is always drawn from the battery). Expect to pay between $150 and $1,000 for an online UPS. The higher the VA rating, the more you’ll pay. You might also want to consider buying one with advanced-battery features. These features include intelligent-battery management, battery-replacement indicator, and hot-swappable user-replaceable batteries. An UPS isn’t intended to power you through a blackout.. For that, you would need a generator. However an UPS is a cost effective way to let you save your work and power down safely. Of course the best way is to ensure that your computer and UPS system is safe and working well is to give us a call. Tested & True ~ test & tag Adelaide uses the very latest in Portable Appliance Testing…The STC Pro-Logger 2 it can perform static testing class 1,2 & M ,RCD testing, Earth Leakage Detection, 3 phase run testing and logs results as you test. all in one neat piece of equipment. On top this all our Technicians are Trained to National Standard UEENEEP008 in test & tag operations, all our Equipment is in good repair and in Calibration. Most of all we pride ourselves on our Knowledge of OH&S legislation and the current Australian Standards ensuring that you get Quality Service at a competitive price. The best single safety investment you can make for your Workplace or dwelling is to buy a Safety Switch. Installing a Safety switch is the most effective method of preventing injury or death caused by electric shock. A safety switch works by detecting tiny differences in current through electrical wiring, and it can detect a potential path to earth. Take the example of a person holding a faulty appliance that has an electric charge thereby providing a path to earth. A truly effective Safety Switch will detect that leaking electrical path and shut all the power down in mere milliseconds, quite often before the sensation of electrocution is felt, thereby preventing a harmful or potentially fatal electric shock. Safety switches are Electro-mechanical devices and over time can be subject to failure. They should be tested regularly to make sure they are in working order. When an appliance becomes damaged or develops a fault, it may start to leak excess electrical current. This excess current will be detected by the safety switch and cause it to trip. The easiest way to determine if this is the problem is by unplugging all electrical appliances at the power point, resetting the safety switch and then reconnecting the appliances one by one until the faulty appliance can be identified. Always use caution when dealing with possible faulty appliances and if in doubt contact an electrician. As the amount of electrical appliances we have in our home increases, so does the likelihood of Nuisance Tripping. If there are a large number of appliances plugged in to the home at one time and a small amount of current leaks from each, the current adds up to become more substantial. This may mean that the safety switch is continuously on the verge of tripping. If there is the tiniest change in electrical current from the electricity company this can push the switch to its limit causing it to trip. This can become more of a problem in older homes where the electrical wiring is not in good condition. Limiting the amount of appliances plugged in at one time can help minimize this type of tripping. Faulty wiring poses the most threat to our safety and presents the worst fire risk. Fortunately, a safety switch dramatically reduces these risks. All wiring deteriorates over time and can become dangerous, so older houses are obviously more at risk. A safety switch will detect any fluctuation in electrical current caused by damaged wiring and trip, cutting off electricity immediately and stopping the wiring from burning out. A qualified electrician can assess your electrical wiring and may suggest repair or replacement. Sometimes the cause of a safety switch tripping can be the switch itself. As with any electrical appliance, a safety switch can become defective with age or mistreatment. Safety switches should be checked every six months to ensure they are working effectively. A qualified electrician can offer advice on how to do this, or do it for you if you are unsure. An Electrical Storm can also be the cause of a safety switch going off. When lightning strikes your home, power lines or a power station it may cause a power surge which can cause a safety switch to trip. If this occurs, it is best to wait until the storm passes before resetting the switch. If in doubt always consult an electrician. Without the right safety equipment and safety precautions, electricity can be deadly. Always check with an electrician if you are unsure why your safety switch has gone off. By the Way did you know that you need your RCD tested as often as every six months, it is SafeWork requirement. Tested & True ~ test & tag Adelaide uses the very latest in Portable Appliance Testing…The STC Pro-Logger 2 it can perform static testing class 1,2 & M ,RCD testing, Earth Leakage Detection, 3 phase run testing and logs results as you test. all in one neat piece of equipment. On top this all our Technicians are Trained to National Standard UEENEEP008 in test & tag operations, all our Equipment is in good repair and in Calibration. Most of all we pride ourselves on our Knowledge of OH&S legislation and the current Australian Standards ensuring that you get Quality Service at a competitive price. A Simple step by step guide to fault finding a tripped Safety Switch. Note: Some types of appliances may cause incidental or nuisance tripping of your Safety Switch or RCD device. Typically Water Heaters, Electric Jugs and Kettles, Steam Irons, Dishwashers, washing Machines, Swimming Pool Equipment, Auto Defrost Refrigerators and Freezers. Most Important: If your Safety Switch has turned off, it has done so for a reason. It has detected a leak of some electricity. This may be through a faulty appliance or it may be a fault in the house wiring. These instructions will help you find that leak. 2. If it stays on then the fault was intermittent or transient and we can do nothing at this stage. Refer to Note above. 3. Think of what you were using at the time. If the Residual Current Device trips off again, got to point 5. 4. Turn on the Residual Current Device. 5. If it won’t stay on then you will have to unplug all appliances! This includes any outside power points or power to outbuildings. 7. If the Residual Current Device stays on then turn the Circuit Breakers on one at a time. 8. When you come to the leaking circuit, the Residual Current Device will turn off. 9. Unplug all appliances that are plugged in to power points that do not work. Turn the Residual Current Device on. If it won’t stay on then you will have to call an Electrician. 10. If it stays on, then one of the appliances you have unplugged is faulty. Plug the items in, one at a time until you find the faulty one. Remember Do not fix any Electrical device yourself, give the device to a suitably qualified electrical repair workshop or if under warranty consult with the manufacturer for the possibility of repair under those warranty conditions. Tested & True ~ test & tag Adelaide uses the very latest in Portable Appliance Testing…The STC Pro-Logger 2 it can perform static testing class 1,2 & M ,RCD testing, Earth Leakage Detection, 3 phase run testing and logs results as you test. all in one neat piece of equipment. On top this all our Technicians are Trained to National Standard UEENEEP008 in test & tag operations by Intertag in Sydney NSW, all our Equipment is in good repair and in Calibration. Most of all we pride ourselves on our Knowledge of OH&S legislation and the current Australian Standards ensuring that you get Quality Service at a competitive price. Which Type Of Smoke Detector I should buy? The latest advancement In Smoke Detection Technology is the Photoelectric alarm they are widely regarded as being superior to ionisation alarms in most aspects. Not only do they respond faster than other alarms and are less likely to cause annoying false alarms. Photoelectric alarms are particularly effective at detecting smouldering fires, which provides the earliest possible warning of a fire developing in an enclosed area. If a smoke alarm has symbol a radioactive warning symbol, then it ionisation smoke alarm. It is generally recommended that you should install smoke alarms in all rooms where people sleep and the hallways leading to sleeping areas. Are there approved smoke alarms? The Australian Standard symbol on the packaging shows if the alarm is approved and safe.Smoke Alarms must meet the requirements of Australian Standard AS 3786. In some circumstances your alarms cannot be hard-wired, then it is recommended that these photoelectric alarms run on 10-year lithium batteries. Inbuilt 10-year lithium batteries last as long as the smoke alarm so you don’t need to worry about replacing them every year – you simply replace the entire smoke alarm unit once every 10 years. A hard-wired smoke alarm consists of a 240-volt smoke alarm connected to a home’s electrical system with a battery back-up power supply. 10 year lithium batteries: These batteries are recommended and last as long as the smoke alarm. Lead or alkaline batteries: Need to be replaced yearly. Available at most major supermarkets and hardware stores buy approved smoke alarms meeting Australian Standard AS 3786. At Tested & True we can help you advise install and maintain smoke detectors for your workplace and residential requirements! The Electrical Switchboard your backup defence in electrical safety. Always replace a blown fuse with the correct fuse wire. Never use fuse wire that is heavier than the recommended gauge. If fuses keeps blowing, or a circuit breaker keeps tripping, check that your appliances are not faulty. Safety switches or RCD device look similar to circuit breakers and will have a test button to provide a test for the correct earth tripping of the device. The purpose is to they provide extra protection from electric shock. Safety switches monitor the flow of electricity and if any irregularity is detected, the electricity supply is immediately cut off. Homes with children or backyard workshops should consider installing safety switches to reduce the risk of electrical accidents. It is imperative that commercial premises have them installed and tested regularly.. New homes and Commercial premises are required to have safety switches installed. Licensed electrical contractors can install safety switches in older homes at a reasonable cost. You can also purchase portable safety switches for appliances and extension cords. Useful particularly when using power tools outside ie Electric Lawnmowers, Hedge trimmers, Drills, circular Saws etc and these portable RCD should also be tested on a regular Basis!